Exploring H.W. Brewer's, Birds-eye view of Portsmouth Harbour. 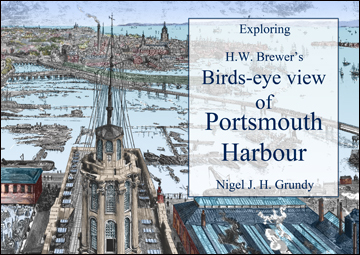 Nigel takes a close-up look at Brewer's birds-eye view and explores the histories of the buildings depicted, including sites at the Dockyard, Portsea, Portsmouth, Old Portsmouth, Southsea and Eastney and shows many interesting antiquarian and contemporary images and photographs of the views. Some of the buildings are no longer there, some were swept away during developments and others were destroyed during the Second World War. Shipping shown in the harbour is also explored and histories, photographs and images of some of the more important vessels is included in the book. H.W. Brewer's 1892, Birds-eye view of Portsmouth Harbour. Working from a balloon, the artist H.W. Brewer drew aerial panoramas and birds-eye views of major european cities, often working in collaboration with W.L. Wyllie R.A., the Old Portsmouth Marine Artist. In 1892 the popular newspaper The Graphic published Brewer’s, ‘Birds-eye view of Portsmouth Harbour,’ as a fold-out, showing the new district of Portsea on the left and across the harbour and Spithead to Haslar and Gosport on the right, with the Isle of Wight in the distance.